Well folks, spring is in the air, the warm weather has arrived, and the fruits are finally starting to look super fresh & delicious! All the fruit screams to be used in a fresh pie, doesn’t it? Did you know that by making a few simple switches, you can make a pie that is much better for your health, much lower in carbs, and tastes just as good! Check out the recipe below & let me know whatcha think! Mix all ingredients together until throughly incorporated. Press into pie dish starting from the middle and working out towards the sides. Bake for roughly 20 mins or until golden brown. THEN FOR THE FILLING: Typically what I do is combine the following ingredients, put everything in a sauce pan & heat until nice & thick. Talk about delicious! Hope you enjoy! But let’s get back to the shoulder, which has allowed me to take a little walk on the patient side of the doctor-patient relationship. Nine months ago I had the opportunity to go on a ten day medical mission trip to Nigeria where my second oldest daughter teaches school. On the last night, after avoiding cases of malaria, dengue fever, car accidents in the crazy traffic, and other mishaps, I succumbed to a case of poor judgment. We were staying at a little hotel with no toilet seats and spotty electricity but a nice location near the ocean. It was getting dark and the surf was pounding. It seemed a little beyond what I was comfortable riding, but I thought one good ride would be worth a little risk. As the wave came up behind me I swam for shore and it definitely caught me very strongly. Immediately I knew this wasn’t going to end well. The wave lifted me high up and the water in front of me drew back until I was practically looking at sand. It kind of felt like being held up by a WWF wrestler intent on body-slamming my helpless little frame. My thought was to not reach out my arms to catch myself because I knew of others who had torn up their shoulders by doing just that. So I tucked in my arms and the wave absolutely pounded me into the bottom. It about knocked me out as I landed on my right shoulder and side of my face and head. As I started swimming for the surface I was amazed at how deep it suddenly felt and how long it took to get to the surface, only to be hit and pushed under by another wave. So, over the next couple of weeks I retold the explanation of my leprous-appearing face a couple hundred times to inquiring patients. Eventually the face healed up. But that right shoulder just nagged along – not severely painful, just achy – except when I tried bowling – then more than just achy. Like many of my patients I kept figuring it would eventually just get better. I tried some anti-inflammitants, and a few exercises, but no real improvement. Then I got working on a barn renovation with some good heavy power tools. Oh, yah, now my shoulder was talking to me and occasionally screaming at me. Pretty soon minor movements like reaching into my pocket for my keys could light me up with a locked-in spasm of pain. So, the day after you read this I’ll be getting arthroscopic surgery. My hope is that you’ll be less stubborn than me and get a joint checked out sooner than nine months and when it is only talking to you, not screaming at you. There’s giving things a chance to get better on their own, and then there’s just denial. Ok folks are you ready to “shake it up” a bit with some cauliflower?!!! Sounds exciting huh! :) Seriously, this recipe is super duper simple and loved by ALL, well most anyway! :) So, everybody loves some yummy buffalo wings and this is a super easy way to get in those veggies and provide a great side dish for any meal or appetizer for any get together, such as tailgating or other sporting events! Prep is so easy, the kids can join in the fun :) And what a great way to get them to try cauliflower when you soak it in some Frank’s hot sauce (that’s if they like the “hot” stuff! :)) The best part, only 7 ingredients and I guarantee you have at least 5 of them in your cabinet right now!!! Enjoy! Make these up for any party or an amazing side dish. Frank’s Buffalo Style Wing Sauce is a must for this recipe. *I probably use about ⅔ cup of hot sauce and they have just enough heat. Place cauliflower florets into plastic bag. Drizzle olive oil over florets to barely coat. Add garlic powder, salt and pepper. Close bag and toss ingredients around so all florets are coated. Place on ungreased cookie sheet or baking pan and bake on middle rack for 15 minutes, turning florets once during baking. Check them at the 10 minute mark for desired tenderness. You don’t want them to be soggy! Remove florets from oven. Melt butter in medium glass bowl. Add hot sauce to butter. Toss cauliflower and stir to cover all florets with hot sauce. Return to oven and cook for additional 5 minutes. Serve with any dip you like, ranch dressing or Blue Cheese dip. *** My best friend and I prepared this for our “better halves” one evening and they devoured it!!! We kept it in a few minutes longer because we liked the cauliflower just a bit softer. We also used a little more hot sauce because she could drink the bottle if you let her :) ha! but I am not that brave! So, they were a little hot for me but I bet 2/3 cup would be just perfect. We also did not add the butter and I am not sure why?? Either I was just out or we forgot but they still turned out fabulous so don’t let that stop you! They are super duper delicious with or without dipping sauce. Remember to put your dipping sauce out in a pre-measured amount to help you control portions with it! Dipping sauces can be full of sugar, however blue cheese and ranch are very low carb. Though low carb, they are calorie dense, so watch portions and try to keep around 2 tbsp or so! 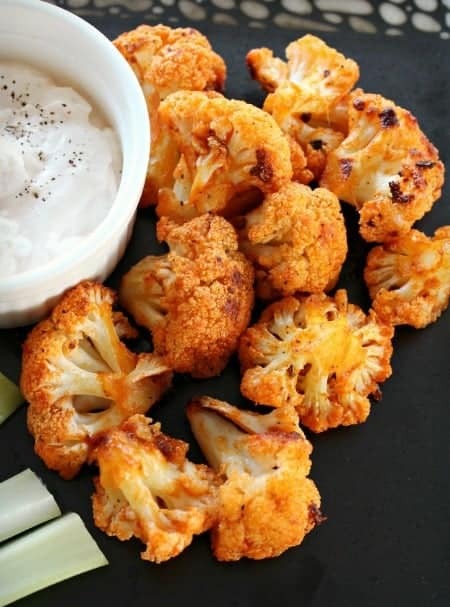 You don’t want to fill up on the dipping sauce, fill up on the super tasty cauliflower!!!! YUMMY! We also had a little left over and it re-heated well for the week! If diabetes is a problem of too much sugar…. Check out this piece on getting to work helping patients instead is sitting around acting like no one knows what to do. Remember that simple isn’t always easy and hard isn’t always complicated. Come see our Nutrition and Wellness Counselors if you want to know the simple and not complicated way to get your health back.